Our class spent the last 3 weeks in a Nature Studies block. 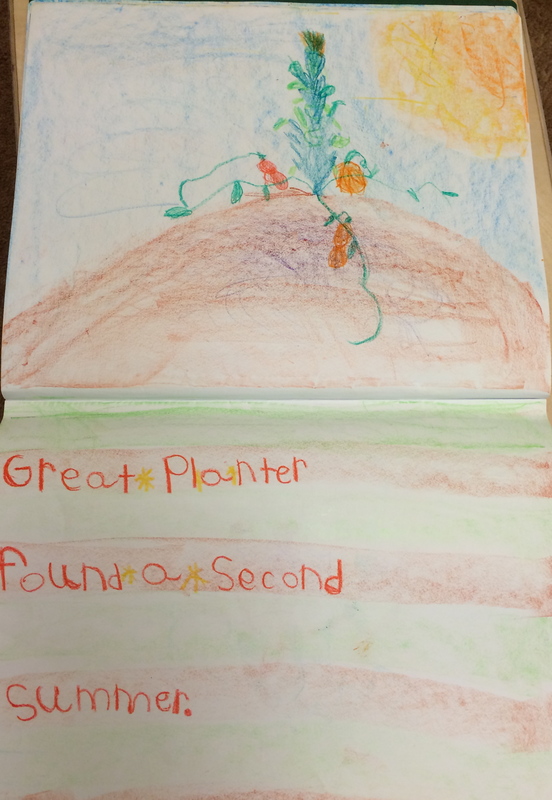 In first and second grade, Nature Studies serve as science instruction integrated with language arts. A 6 to 8 year old child wonders about the world and asks many questions. Rather than answer their questions with analytic responses, we tell stories that capture the scientific concept while still leaving room for mystery and magic. The stories keep their imaginations alive so that the child can still wonder about the concept and explore it. This is the opposite of responding to a child’s question with a factual answer that often inhibits further curiosity. In telling a story, we meet the child in their developmental place. It is not until 12 or 13 that a child can understand abstract concepts and think critically, and these are mental constructs needed for analytic thought. 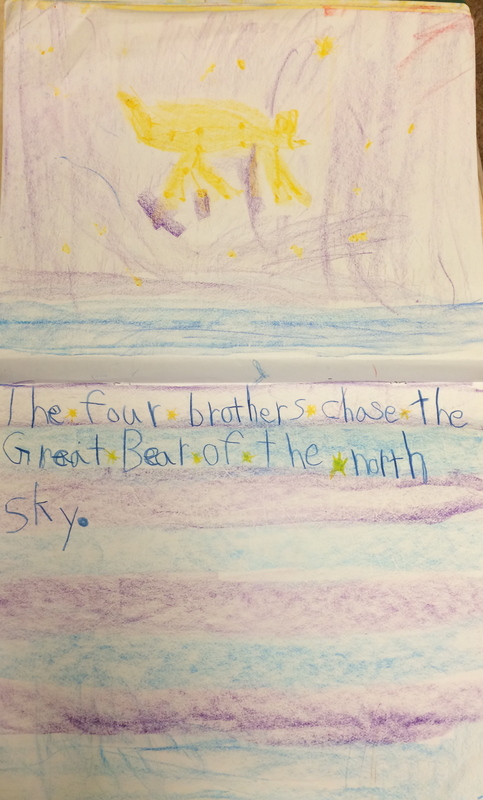 By telling a Native American story about The Great Bear in the Northern Sky, where the children hear about four brothers who hunt a great Medicine Bear only to find that they chased the bear right into the starry sky, the children hear about Ursa Major and how it revolves around the North Star in a way they can comprehend. Then they are excited to look up into the night sky and see the Bear from the story they have heard. In middle school, they will take an astronomy class and learn how constellations in the northern sky circle around the north star and that this is related to our planet’s rotation in space. Our hope is that the story they heard as a young child helps to foster a sense of wonder in the scientific explanation they receive when they are older. The Native American legend also gives a connection between science and humanities, which helps integrate the scientific concept into its place in history. When he/she is older, the child will remember how people interpreted the stars before modern scientific methods emerged, thereby integrating the new information more fully. We may begin slowly in Waldorf education by waiting to teach reading and writing until 1st grade and by holding off on analytic science instruction until 4th grade, but the rich and deep experience the children receive at appropriate times according to their developmental capacities broadens their outlook and their abilities. So, I told many Native American legends in this block. We began by talking about the Ais, a Native American tribe from Ft.Pierce, FL – which is where I grew up. I personally learned much about these people this past summer and wanted to share with my class about the area I grew up. We learned about their homes, communities, tools, foods, and activities along the coast of Florida. I used this opening to introduce three more letters to the first graders and to continue with long and short vowel sounds for the second grade. The next story was an Iroquois legend about the Four Winds. Again, I introduced the last of our letters to the first grade and worked on short and long vowel sounds with second grade. We drew pictures and talked about these stories as a class. We learned how the Ais people made everything from items in nature and how useful it all was. We learned about the seasons in the story of the Four Winds and the type of weather characteristic of each. 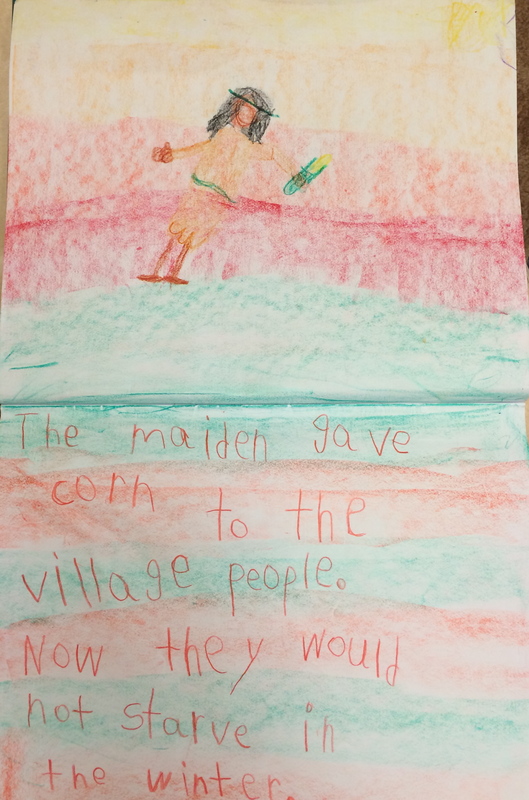 I told another Iroquois legend called “The Corn Maiden” which explained how they were given corn to grow and eat and then a Penobscot Tribe story that told how they found a second planting season in late summer. Then I told a Salteaux story about maple syrup! 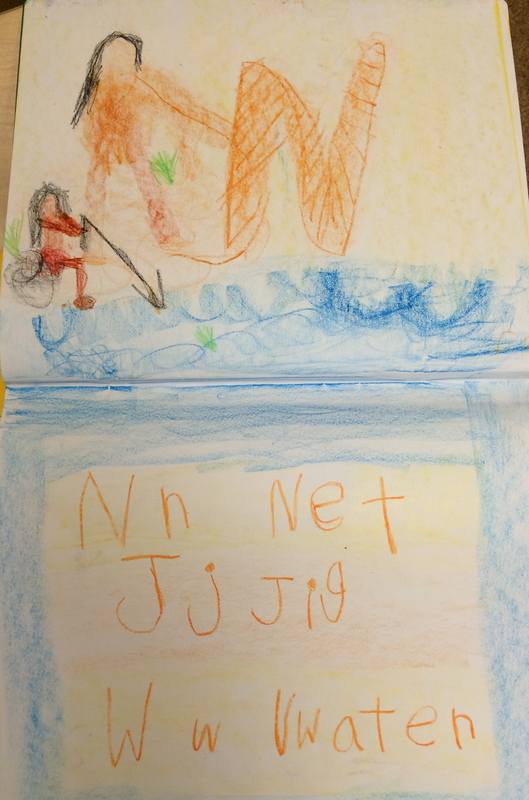 With these stories, the first graders began to write sentences into their main lesson books. After all of our letter work, they were ready and they were excited! 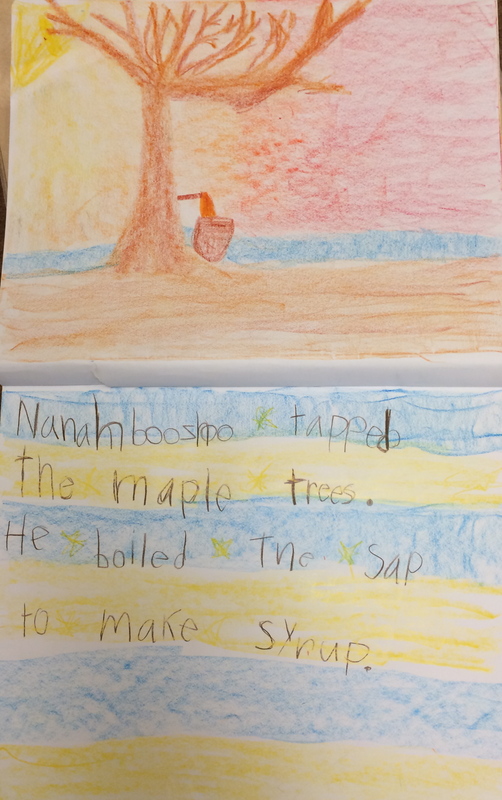 Second graders helped compose all of our sentences and wrote two sentences into their books following the pictures we drew for each story. 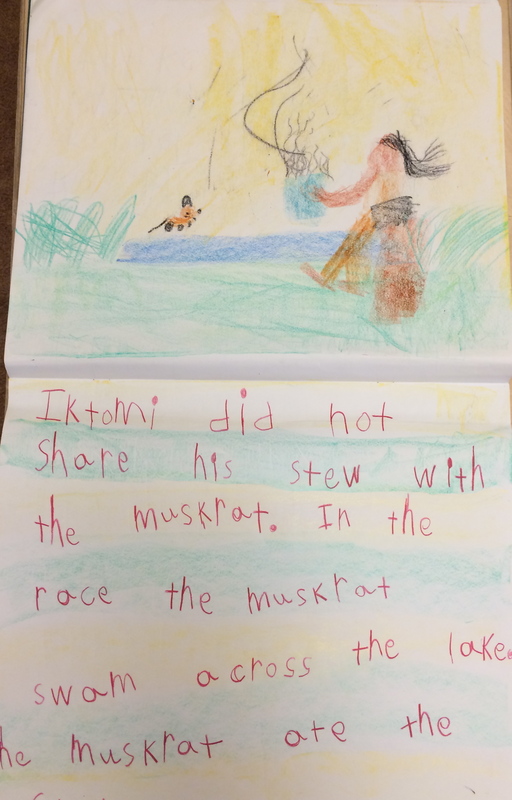 Frau Hans came in to substitute for me and she told three stories about Ik-to-mi, a trickster character from Dakota legend. The trickster character will be revisited again when we hear fables in the spring. Trickster tales are perfect for our second graders, who often experiment with the same kind of naughtiness themselves. Frau Hans had the children draw pictures and write sentences in their main lesson books and she talked with them about Ik-to-mi as well as a few general nature concepts from the stories. She also brought in her collection of arrowheads for the children to see! We finished our block with two stories about the sky. One mentioned above and the other about the origin of the Milky Way. 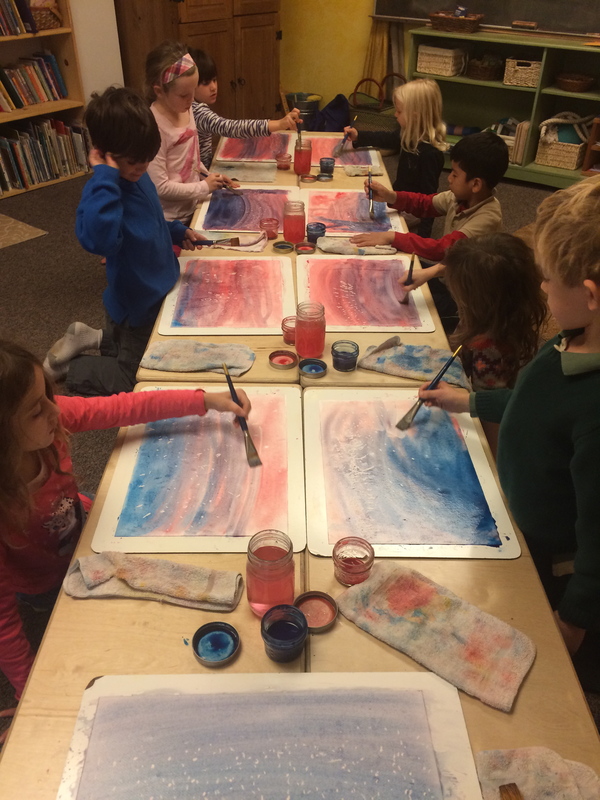 We tried to use birthday candle wax as a resist on our painting paper and then paint a deep purple night sky to show the span of stars – which was cornmeal falling from a Spirit Dog’s mouth as he ran panting across the sky!